Which is, in your oppinion, the most appropiate hand held weapon to defeat a roman legionnaire? Note that it is very important not only to block the short sword attacks but dodge the large shield in order to win the fight. I was wondering if a spear or an A&A Hungarian Axe could be appropiate for such work, or if woud become too cumbersome at the moment of the strike . Note: no missile, siege or fire arms allowed. A Roman legionnaire is really no more dangerous than any other warrior in any time period. The real trouble with dealing with them comes when there's a legion of them. If you're just fighting one, it's merely a question of what weapons the opposing warrior is most comfortable with. Are we talking in-period, or warriors throughout history? Didn't you forget about the legionaires pillum? They where the Dacians weapon of choice when opposed by the might of the romans. Forced the Legions to make some alterations on their helmets. Pirus had a good deal of success against Roman legions with his Macedonian Phalanx. Basically they had huge spears many rows deep that came all the way to the front. The army resembled a giant porcupine. Philip II, Alexander the Greats father, refined the tactics based on earlier Greek Phalanx. The Romans were only able to back Pirus down through attrition. The Romans were able to raise more men from their allies around Italy. In the first Macedonian War Roman also nearly lost to the Macedonian "porcupine" phalanx. The advantage that the Romans had was that their armies were organized into smaller mannipole units. The Roman general was able to spot a place along the Macedonian Phalanx that had not formed up yet. He was able to then send a mannipole unit to attack that one spot. Macedonian Phanax's are less maneuverable and were not organized into small units that you could just break a section off and send in different directions. The Romans went into the first Punic War without at navy. They did not have one up until that time and had no sea support. This is something that an enemy could take advantage. During the first Punic War they found a Carthaginian ship that was wrecked. The reversed engineered it and built a navy based on that model. Given that they had little experience in sea battles, they invented a huge boarding ramp with spikes at the end that would come down and lock two ships together. The Romans would then fight as they would on land. An opposing sea captain would do well to prevent that from happening and focused on ramming tactics. Such tactics require more skill at seamanship. The Roman's were so lacking in such skills at the time that they lost most of their fleet in a storm near their cost. Historians agree that this could have been prevented. This was no consequence to the Romans, their determination in war was such that the simply built more ships. Romans by the Second Punic war were still not comfortable in fighting against Cavalry. Hanible's Nubian horsemen were able to defeat weaker Roman Cavalry and then attack ground troops from behind. Stirrups and heavy horse-charges were unknown to the Romans in this time. I do not believe the Carthaginians had stirrups, but they did exist further East. It is feasible in this time period to build an army based on heavy horse charges as seen in the 11th century. All the equipment, armor and weapon did exist or were within capability of the technology at the time. War Elephants were also a big threat to Roman Legions. They lucked out at the Battle of Zama as the Elephants mostly charged down open corridors between the legions and out the back. I think if the Carthaginians had a chance to redo that battle the outcome would have been different. From what I understand, I'd say that any period hand weapon would be appropriate. What made the Romans so formidable was not their weaponry but their discipline and tactics. They were great at containing the unorganized mass onslaught of the opposing forces such as the Celts. Their stagger blocks of infantry tended to break up the solid lines of opponents which tended to fold in aroung them and ended up being attacked on three sides. They also overpowered the opposing wall of shields by throwing their pillums into them and making them too heavy and ackward for the opposing soldiers to handle. If it's sword and shield on sword and shield, take an Iberian Falcata, and the Celtic shield. I happen to know for a fact that Romans are scared of Falcata, because you can chop right through their shield, their helmet and their head with one big swing, provided you get the edge of the sword on the edge of the shield . So you'd get the psychological edge, as well as the serious chopping power. If the shield comes up, pull it down and chop the top of their helmet, or chop them at the knee, just above the greaves. Not in any way period but the Romans might have found the great Danish axe or a later halberd very challenging. How exactly, do you plan to cut the head from the pilum, exactly? And how are you cutting at the legs? The shield covers those. Roman scutums were about 4 feet in length. Romans were about 5' 3". I don't think getting at their legs would be possible, especially in formation. You really have to out-flank them or crash into them with elephants. Spear thrusts to their open face helmets would work in a frontal attack. I also agree with the feasibility of throwing pilum into their scutums to render them unmaneuverable. I do not agree with the idea of breaking through their shields with heavy axes and other weapons as a matter of overall strategy. Scutums weighed about 22 lbs according to one estimate. That is not a flimsy shield. I can accept that shields did break in the normal course of combat, but I don't think it is wise to approuch a Roman legion with the intention of axing through all their shields. The Romans also had a very well organized method of cycling their front lines for the purpose of rest and water. If the shield on the front line broke, I think all he would have to do is step back and be replaced by the man behind him. The Romans had that sort of stuff down to a science. I said that when the shield comes up, attack the legs. I also said that when the shield comes up, pull it down, using your shield or shield hand, and the resulting loss of balance leaves the head wide open. The curvatures of some Roman shields leave a nice spot at the top or bottom to hook your shield or hands into for this. Iberian Falcata are renowned for being able to fairly easily slice through Roman armour. The Roman helmet was redesigned after encountering the Iberian Celts because of the sheer power of a Falcata Espadachin. We all know that Celts were very early bloomers in the development of excellent blade materials... And a Falcata is highly maneuverable, as it IS a short one-handed sword. Practise would make it quick as well, plus a sturdy Celtic shield offers the protection you need. The Falcata, therefore, is a Roman-killing machine. I can't think of anything of the same period more effective. Now, an experienced Legionary knows that the real power strike, and indeed most common strike, of an Iberian Falcata is a downwards chop from over the shoulder on to, or over the top of the shield, and onto the helmet, neck, shoulder or spear arm. Your Legionary will, for lack of dodging space or time, and by pure instinct, bring up the shield to survive. There's no way he will risk taking one of those hits if he can at all help it, and there's your opening. There's naked Roman flesh just above the greaves... If armour crumbles to a Falcata chop, a leg is at serious risk of removal, correct? And landing a blow on the neck is an instant finish. And I remove Chinese spearheads ALL THE TIME in matches. It's a timing thing. Something with the cutting power (I'm not exaggerating, you know...) of a Falcata is far more than up to the task of removing a pilum head with a single, well-placed hack, trust me. Even taking the thrust to your shield and hacking the head off while there is very possible. The Legionary is very vulnerable in the short time (depending on experience...) between his spear being rendered useless and his trying desperately to draw his sword. This would all be very effective against a single Legionary. But in formation, part of a whole advancing Legion, his left and right buddies would support him and these tactics would backfire miserably. the falax while an awsome weapon didnt do much to stop the roman army... they completely whiped the dacians from existance. when attacking the roman legionaire's foot, his buddy will stab you thats right beside him. even elephants didnt do very good. the one and ONLY thing that will stop the roman army is guerrilla warfare. attack them when they least expect it and are not ready. once they were in formation, it was really hard to go against the wall, wedge or tustudio. Romans had the hardest time with cavalry armies. They never concquered Parthians. Their combination of horse archers and cataphract charges was to much for Roman legions. Which is, in your oppinion, the most appropiate hand held weapon to defeat a roman legionnaire? I once saw a history channel documentary which claimed that some late-imperial legions ran into trouble against a Germanic tribe armed with axes. I think they were throwing axes (which sort of invalidates your terms). That's the only memory I retain and I'm even fuzzy on those details, but maybe it rings a bell for someone. Wow! Those weapons look quite dangerouse. The second one looks like patern welded blade. Do you know, who made it? Do you have references for this? I ask because every claim of a hand weapon able to cut through armour that I've ever encountered before has proven to be exaggerated. Now I'm really curious What kind of matches are these? Important distinction there that defeating a single legionnaire or a small group of them in a skirmish where their numbers are too small for effective holding of formation is very different than finding a weapon and tactical system to defeat a legion. In their time the Roman legionnaire was heavily armoured but if we match him up with even more heavily armoured men-at-arms (On foot in this case ) armed with poleaxes, Danish axes and other halberd type weapons I still think that one on one or in small groups this would be very effective. For major battles one would have to match Roman discipline and develop specific group tactics adapted to the suggested weapons. Although missile weapons were excluded from the original question I think combined arms would be much more effective than any single weapons choice: I would combine my suggested heavy infantry with foot archers/crossbowmen capable of piecing the Roman shields ( The crossbows should be able to do so at least ). I might add some light skirmishing javelin and axe throwers and heavy cavalry and horse archers. But then I'm talking what kind of army I would assemble to defeat Romans. ( Note: excluding gunpowder weapons otherwise might as well go for machine guns ). He does not stand alone. Nothing can "slice" through armor. They would be wearing hamata, and the combined strength of the rings would make your cut harder to damage him. Not to mention that there are tons of SHIELDS in the way. Roman legions where not a bunch of conscripted yahoos at this point. They where trained to act as one with their manipole. I have attached an image of a pilum to refresh your memory. In order for you to be "cutting" the head off, you would have to be attacking it in mid air. They're a throwing weapon, unsuited to close combat. Which makes it moot, no? OK, now I see that what Otto asked was "Which is, in your OPINION, the most appropriate HAND HELD weapon to defeat A Roman Legionnaire?" A Roman Legionnaire would be meaning singular, would it not? Otherwise, Otto would have written the plural form, Legionnaires, or Legion. This would tend to imply a single Legionary, and as such, he would be standing alone. I will have the Falcata references for you very soon. I am a 30yo white guy who loves Asian swordsmanship. Asian swordsmen often (wait... scratch that, replace 'often' with 'invariably') resent this. 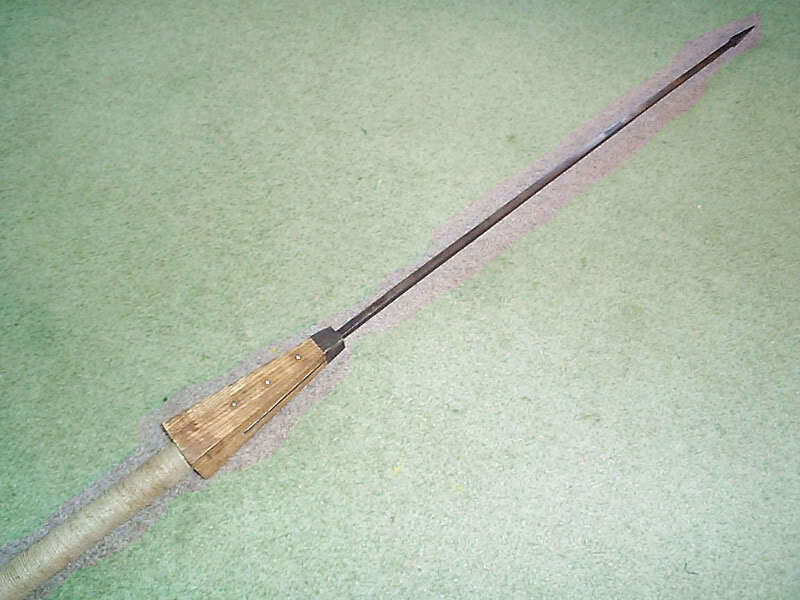 My favourite weapon is the Chinese Jian, 80cm blade, 23cm handle. I have three of them in various replicated historical styles and steels. I find Chinese Red Oak to be excellent for Mujian and Bokken, or wooden swords. I practise 3 hours a day on weekdays, in the rain, hail, or NZ's famous "no-ozone layer, 5 minute burntime" sunshine. On weekends I practise as long as I can without passing out. Sometimes I have wooden or bamboo weapon matches with people in their practise hall, kwoon, dojang or dojo purely to see if I can beat them. They have to be good, or at least well-known for this to happen. I seem to do alright - about 55/45 win/loss give or take in 12 years and 7 countries. I may have had more than 600 matches, I think. I don't bother counting, I do it purely for progression and not for recognition. I learnt to speak Japanese, Chinese and Korean to be better at this. Sometimes I do it for money, because someone has bet that I can beat someone else. This is illegal, and doesn't happen often. I've only lost four times in these gambling matches and each time I recovered fairly quickly. I have probably had around 60 to 70 fights like this. Sometimes I get my friend/s to attack me for practise, and to develop something new. I have about a dozen people who occasionally come for learning and teaching. And sometimes I just don't like somebody or they insult me, and so I pick a fight to make myself feel better. These are only ever weapons matches if I know the other guy can use a weapon. I can also do quite well with empty hands. Here in NZ we have Maori fighters, who use wooden and stone weapons, and have excellent technique. If you want to check it out, google "taiaha" or "patu". And that's the kind of matches I mean. I know that if NZ had any kind of re-enactment or SCA scene, I would be obsessed with it, but unfortunately, we don't and I seem to have found the perfect replacement outlet.